For the three people following this blog, there are good reasons why I haven’t been posting here… I’ve been busy somewhere else! For her MISY427 class (Information Technology Applications in Management), Andrea Everard, Associate Professor in the Department of Accounting and MIS, has started using an open textbook published by Flat World Knowledge. This blog post will cover some of the benefits and challenges that she perceives regarding the use of open materials. Q. In your own words, what is Flat World Knowledge? What is their business model? Flat World Knowledge (FWK) is an open textbook publisher. Essentially, high quality content (and often more relevant and up-to-date information) is available to students for free (online access) or much reduced cost than traditional textbooks. As with any business model, you need a strategy, capabilities/resources, and value. Well, the strategy is that they want to provide high quality content at a low (or no) cost to students. Additionally, they want students to be able to access the information from anywhere (online) although they provide the ability to have a print copy (full or partial) of the textbook, a download for an e-reader (Kindle or Nook, for example), and an audio version. In terms of capabilities, the textbooks are written by well-known authors and experts in the field. And they have the technology to support the delivery mode. 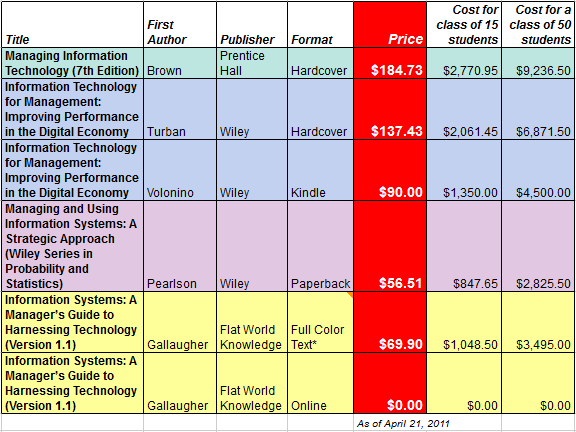 And most importantly, they are adding value in providing free/low cost, high quality content to students (see list of other books and associated costs in the table below, click to access spreadsheet). They are providing value in terms of offering a “green” alternative to textbooks – no paper, no ink. * Gallaugher’s full color text printed version is the most expensive a student can voluntarily buy from FWK. They are also providing value by making sure that the textbooks provide up-to-date and relevant content. I teach courses in information technology/systems – and staying current and providing relevant material is always a challenge. To give you an example, two topics that are currently “hot” are cloud computing and incorporating the use of social media in a firm’s strategy. While the open textbook covers these two issues in quite a bit of details and provides current and relevant cases, the traditional paper textbook only covers these topics summarily. While covering these topics I actually use YouTube videos and recent WSJ articles. It really brings the topic to life for the students. Q. How did you find out about this open textbook? What made you adopt it? From a discussion with a colleague. We first spoke about FWK books over a year ago. I finally seriously looked into it over Winter Break and decided that the content was of excellent quality and the price was great and that an open textbook would be so convenient for my students. For the Spring 2011 term, I used the FWK textbook in conjunction with the textbook that I have been using for several years. Q. Why do you currently use a regular textbook in addition to an open textbook? Well, switching over to an open textbook struck me as somewhat daunting at first. So I decided to use both a traditional textbook and the open textbook. It was in essence a safety blanket – I was comfortable with the traditional textbook, I wasn’t sure how my students would respond to an open textbook and didn’t want to leap into the open textbook arena without first taking a few ‘baby steps’. One term of baby steps and I am now ready to plunge right in! For Fall 2011 I will solely adopt the open textbook. And just today I found out that FWK provides a version of the textbook for my Nook (Barnes & Noble’s version of a Kindle) – I am quite excited about this! Q. Did you make changes to the canonical textbook to fit your needs? For Spring 2011, I used the open textbook as complementary to the traditional textbook. I did not assign the whole textbook but only certain sections of it – and I did not change/customize any of it. For Fall 2011, I will customize the open textbook. Once this term is over, I will go through the book and choose what I want to keep, what I want to move, what I want to tweak. It will be a textbook that will fit exactly the course that I teach! I very much like that! Q. How do your student and colleagues react when you tell them you’re using an open textbook? What is their perception? When I first introduced my students to an open textbook, they were surprised but liked the idea that it was free if they read online. I have been soliciting feedback from my students all term. What they have to say is very positive. Students are digital natives, they adapt very quickly to new technologies, they are willing to try new things. I don’t think the students will have much resistance to using open textbooks. When I speak to my colleagues about open textbooks, their initial reaction is skeptical. Open textbooks are a change and change doesn’t happen easily. I think it will be a while before a lot of faculty even consider open textbooks. Some, of course, will be early adopters and curious and look into the idea; some will never get there. A lot of the resistance has to do with perceptions: often, if something is free, then it is assumed that the quality is low. You are going to need a few faculty to really support and champion the issue – that way, you’ll start to get acceptance. I did speak with an Accounting faculty the other day– it was amazing to see a complete change in attitude after I spent ten minutes showing how an open textbook could work for an Intro to Accounting class. I showed her who the authors were (both were from very highly regarded institutions), how easy it was to access the book, how to read it free online, the different access methods available (printing a chapter, printing the whole book, reading it online, etc.) and so forth. By the time she left my office, she had written down the url and said she would look into it. So, I can conclude that a lot of the apprehension is mainly from just ‘not knowing’. Again, this is something so new, so unlike anything else – it’s going to take time. Q. Could you share data on the version of the open textbook your students used or purchased? Definitely. Before the end of the term I would like to have drafted a survey and distributed it to my students. I am interested in their feedback, their perceptions, their experiences with the open textbook I used. I would also like to get a survey out to faculty members – I think it is easier to address concerns, fears, and issues if we truly understand what they are. Q. Would you consider writing a textbook for a publisher like Flat World Knowledge, in comparison with traditional textbook publishers? I would consider it – although, given that one of my main goals right now is to get promoted to Full Professor, I need to focus on research that is published in academic journals rather than write a textbook. If the question is would I consider an open textbook rather than a traditional textbook, I would much prefer an open textbook. I believe that is where we are headed in the future. Q. In conclusion, do you have any advice to give to fellow faculty members considering the adoption of open textbooks? Don’t be afraid to look into them. Get your hands ‘dirty’ and see what’s available in your area. You might be very pleasantly surprised! There are some great resources out there and I truly believe that the future is going to be open textbooks. And in terms of providing students with a truly convenient, accessible and affordable solution – you really can’t get any better! Of course, if I can be of any help to anyone, I would be glad to share my experiences. 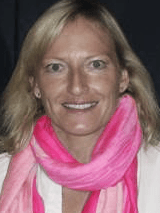 Andrea Everard is an Associate Professor of Management Information Systems at the Lerner College of Business and Economics at the University of Delaware. She received her Ph.D. in management information systems from the University of Pittsburgh. Her research interests include human–computer interaction, cross-cultural issues in information systems and information systems and strategy. Journals in which her work appears include Journal of Management Information Systems, Communications of the ACM, Journal of Global Information Technology Management, and Information Systems Journal. She can be reached at aeverard@udel.edu . On April 11, I’ll be a guest speaker in Nancy Lavigne’s EDUC857 class to discuss the use of technology in higher education. I’ll use this post as my home base for all the collected materials I’m going to use and that the class will produce. As a framework for the session, I’ll use Jonathan Mott’s Open Learning Network, discussing the LMS and institutional technologies vs. web 2.0 resources. I have already created a Diigo list and a Diigo group for students in the course, as well as a shared Google doc. I have created a new blog centered on open education, electronic textbooks, and the use of social media in education, so you’re encouraged to follow it if those topics are of interest to you. I’m also gathering faculty stories around these topics to showcase on the blog, so if you have juicy examples, please let me know!